I've been making irregular but steady progress with the Narrow Planet NS2 kit I got last Christmas. It's not a difficult kit at all, but I've been tackling it alongside (i.e. in gaps in) other projects. 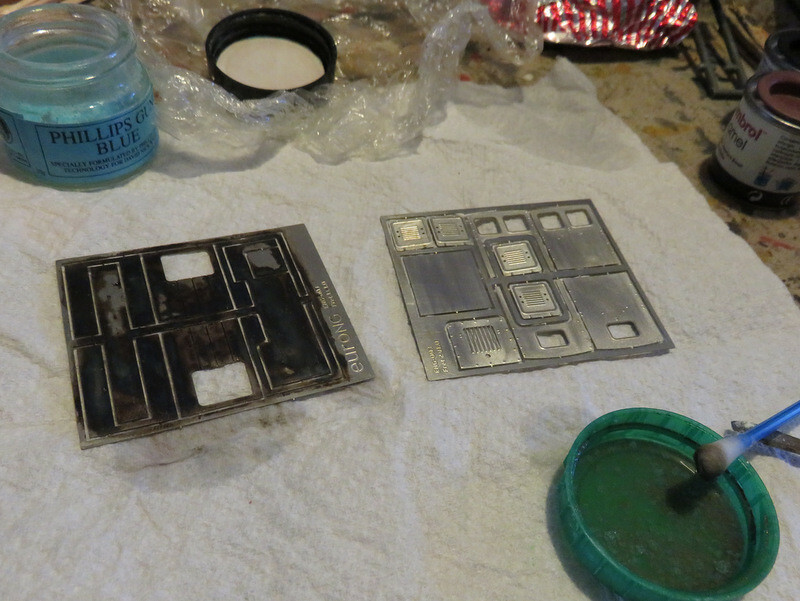 My first step was to blacken the etches, which helps paint to adhere later. I'm using some gun blue applied with a cotton bud. The etches were sprayed with an etch primer, while the 3D print was given a normal primer (both Halfords). The print was given a little attention with emery paper and home-made sanding sticks (emery paper glued around a coffee stirrer) between each of two or three coats of primer to ensure a good quality finish on the areas that would be visible (bonnet top and sides, and under-frame). Even though it's a top quality print a few minutes work between coats of paint is a worthwhile investment. The etches were then assembled - here you can see their lighter shade shows the etch primer, compared to the slightly darker shade of the standard primer. They fit well but once again, to get a good finish I filled any gaps (you can see the green filler) and spent a little more time with the emery paper. 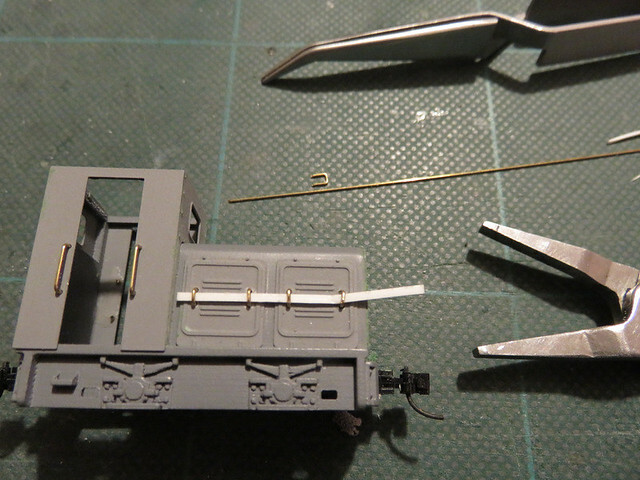 As usual the Microtrains couplers took some thought to mount, though the solution proved relatively easy. I drilled four holes in the coupler block at the corners of the slots, put a fine coping saw blade through a hole and cut out the square opening. 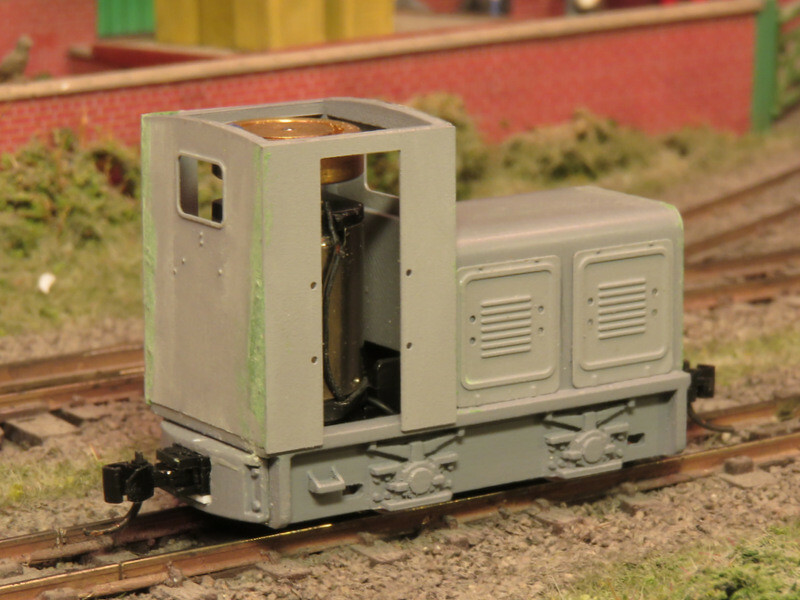 A similar square opening was needed in the buffer beam behind, making space for the coupling draft box. 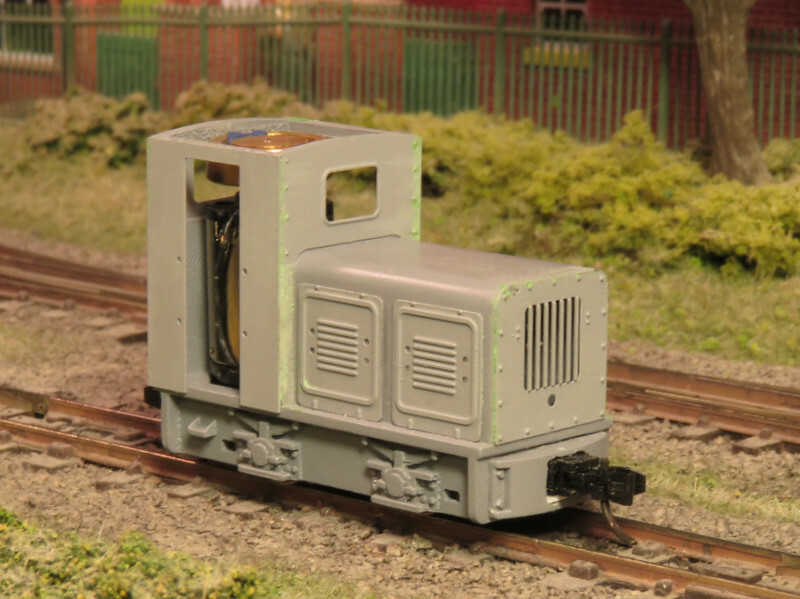 After painting a wire pin will be passed through the buffer block and coupling to secure it in place. Handrails came next, and those bonnet panels needed a lot of handles! As the etches are laid over the print they needed drilling out too, with a fine bit in a pin vice. The 0.5mm wire was bent around the flat nose pliers, you may be able to see the mark I made where the width was correct to form the handle to a "U" shape. The strip of 20 thou plastic was used to space them equally from the sides while superglue was applied from inside. So it just needs the cab roof adding, then I expect another coat of primer before the top coat. I've not yet decided on a colour, though I'm quite tempted by red for a change, as on this NS2f, though the wasp-stripes may be a challenge! The body went together with little problem, and proved to be well detailed. 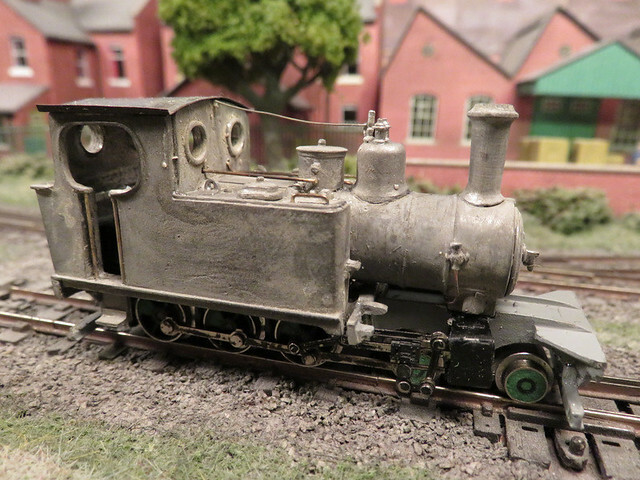 I replaced the cab roof with one bent up from thin brass, and added handrails, pipes, and actuating rods from wire. At this stage the body had been blackened in preparation for an etch primer - the blackening doesn't do much to the white-metal, but I think it helps the paint stick. The problem was at this stage it still didn't run smoothly. - The driving wheels are not all the same size! Finally I've got it complete, and running smoothly without jolts and binds. OK, the Minitrix mechanism is very noisy, but that is normal! But I cannot recommend the kit to the inexperienced. This view shows the wheels nicely, the trick of carving back alternate spokes and using filler for the balance weights is really convincing - removing one of the big problems with N-gauge chassis of too many too fine spokes. The pony "disk" wheels should probably have more of a profile but it's better than spokes. 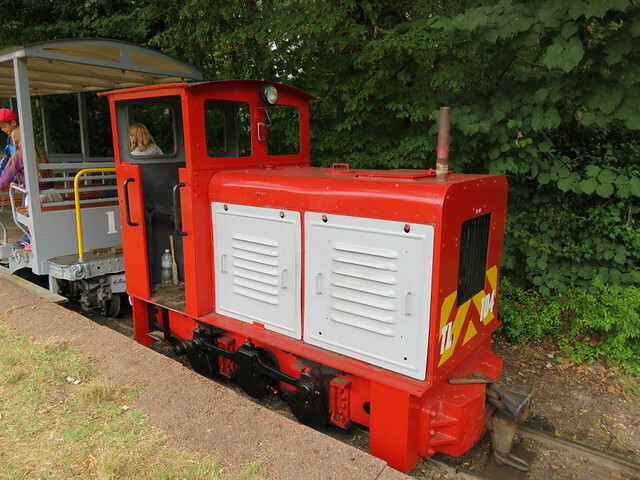 The result is a fine looking, hard worked but reasonably well kept loco, and should look at home shunting goods at Awngate or hauling passengers to Hexworthy. It's been a challenge but I'm glad I persevered, and thanks to all those who helped along the way. 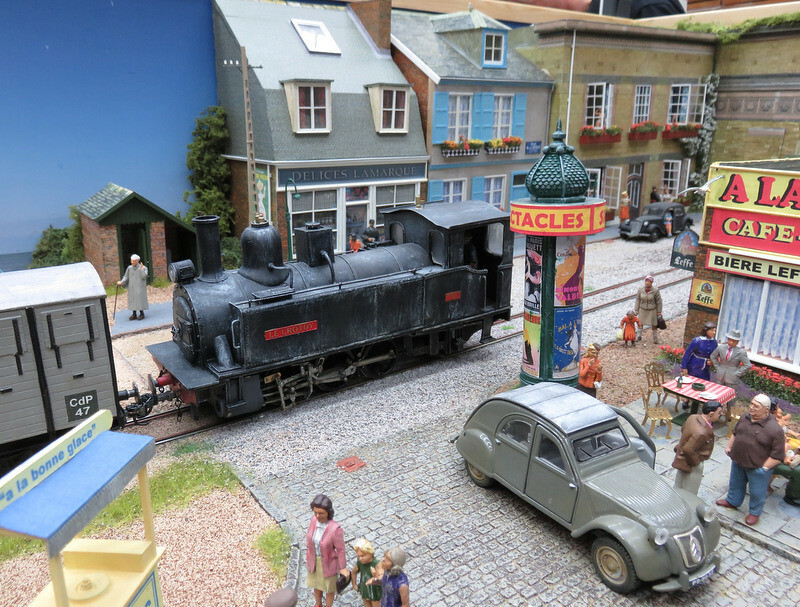 Last Saturday was the annual Expo-NG show at Swanley in Kent. 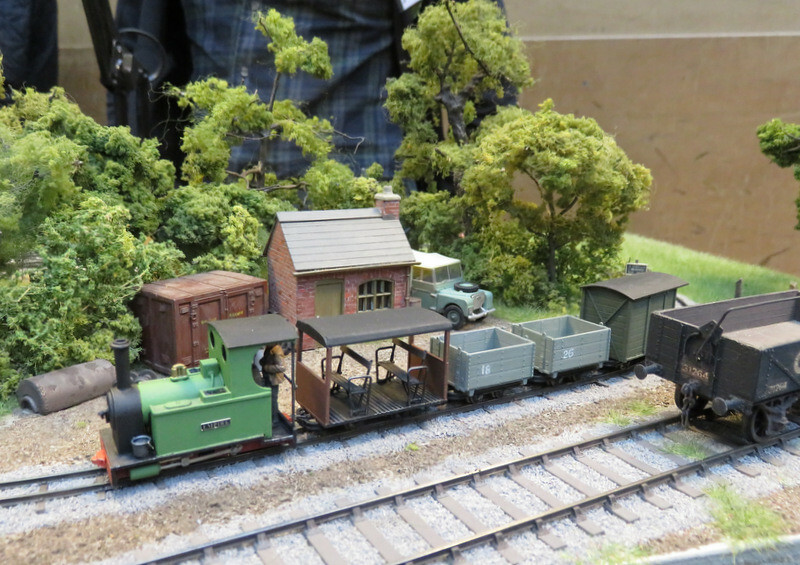 This is the biggest annual show in the UK narrow gauge modelling scene, and as well as a selection of layouts in different scales from around the UK and beyond, there is excellent trade support from the specialist suppliers - many of whom are rarely seen at shows. 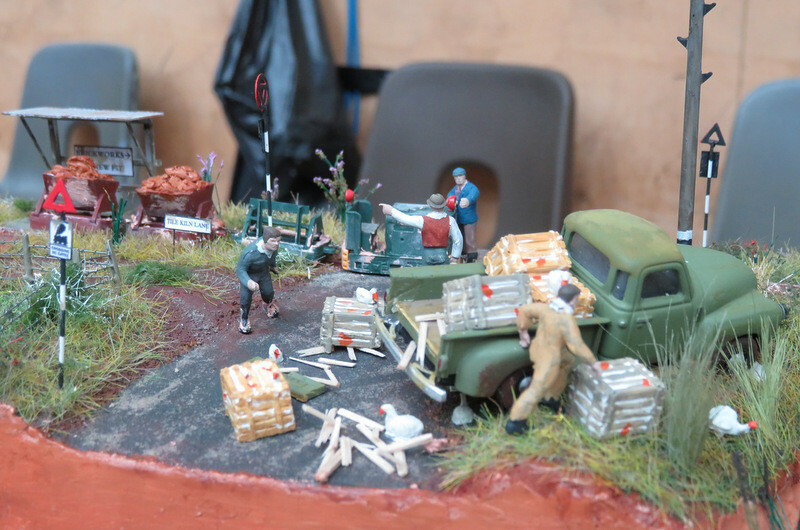 This year the show seemed a little smaller than usual (by a couple of squash courts), but this was down to the layouts present being smaller on average (but no drop in quality or, I understand, number), and fewer entries to the Dave Brewer Challenge - at least compared to last year. 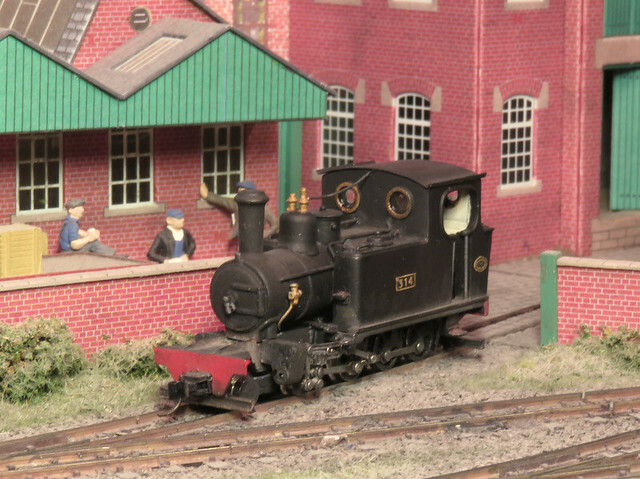 Unusually for me, one of my favourite layouts was large scale, and of an overseas prototype. 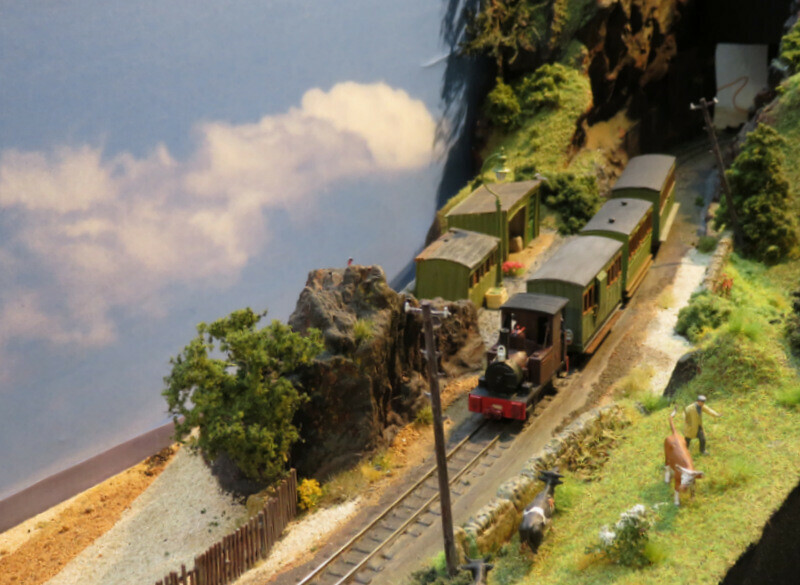 Mer les Bains (1:32, 32mm gauge) by Peter Smith was full of French atmosphere, with a high level of detail and finish. 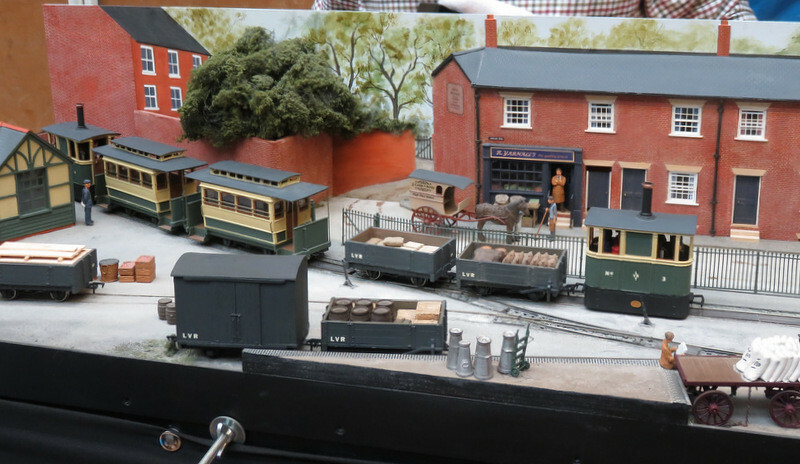 Another favourite was Lambton & Verdane Regis Tramway (O16.5) by Stuart Marshall, a freelance street tramway that had a cohesive and convincing feel. I heard this won the Reinier Hendriksen trophy, which I think was well deserved. 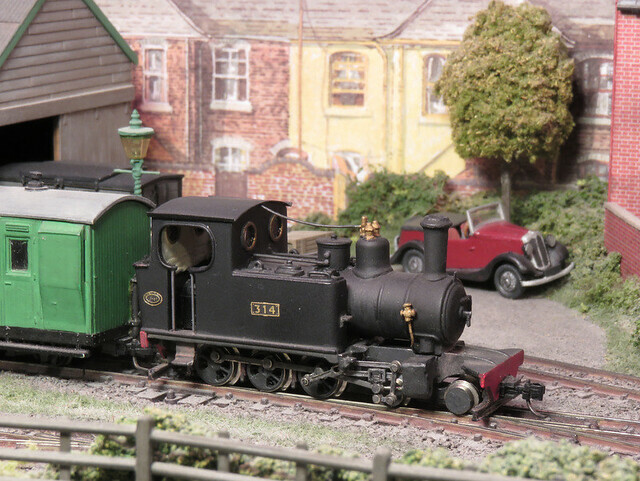 Creech Grange (006.5) by James Hilton is a superb if tiny piece of modelling. 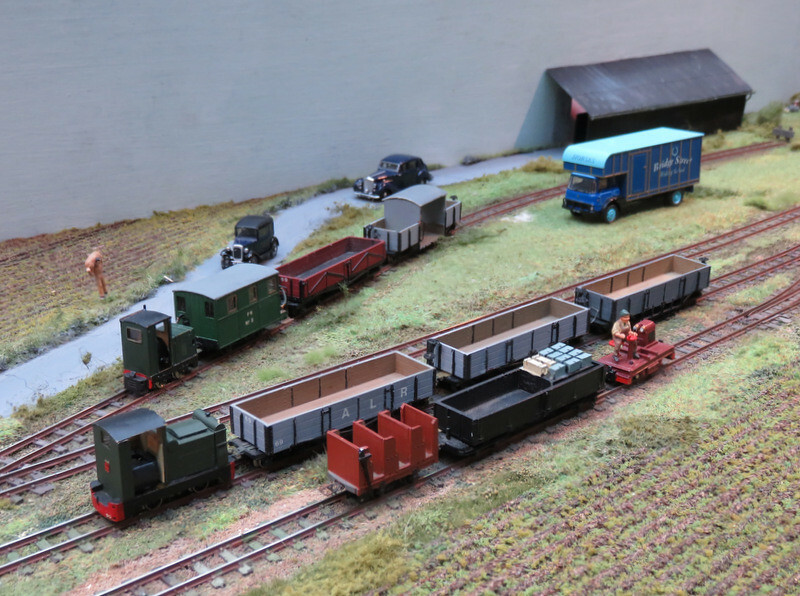 James has used Busch HOf (6.5mm gauge) mechanisms to model a 15" gauge estate railway, scratch-building loco bodies and rolling stock from a variety of methods including some 3D printed. 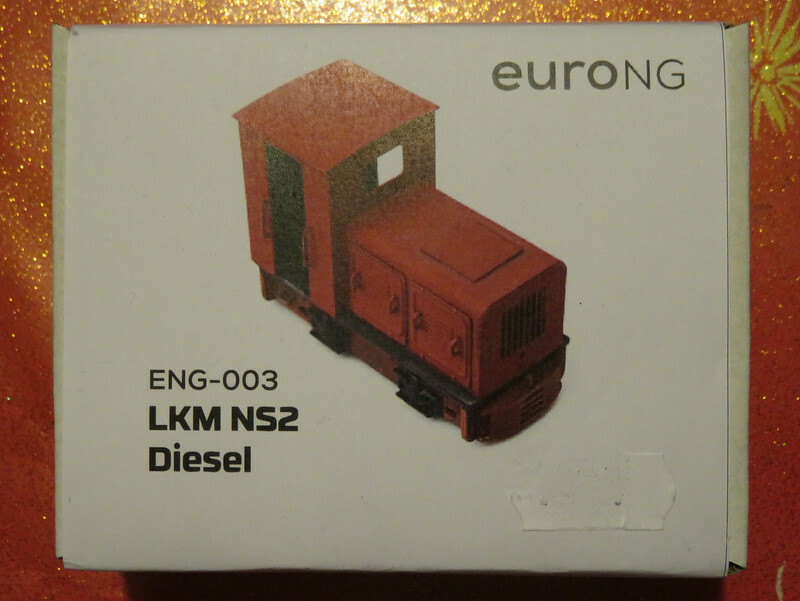 As an illustration of how small this is, the standard gauge siding is EM (or possibly P4). 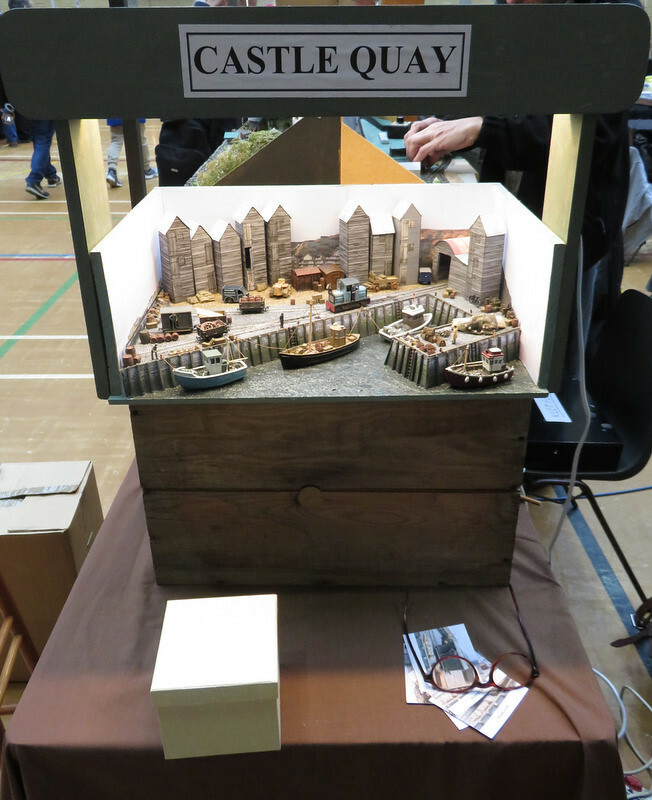 Another tiny but detailed layout is Castle Quay (009) by Chris O'Donoghue, which shows how much can be packed into a small space (a wine box in this case) in 009. The tall net sheds set the Sussex coast setting, while the boats started off as souvenirs from seaside shops. Underhill Town (009) is a larger layout by John Wooden, showing several stations along his imaginary line. The towns were delightfully detailed, but my favourite scene was this beach halt, where the view was downhill towards the sea - an unusual arrangement that worked really well. Holbeach Estates Railway (009) by Stephen Sullivan captured the wide open spaces of the fens, with the workings of a potato estate railway. 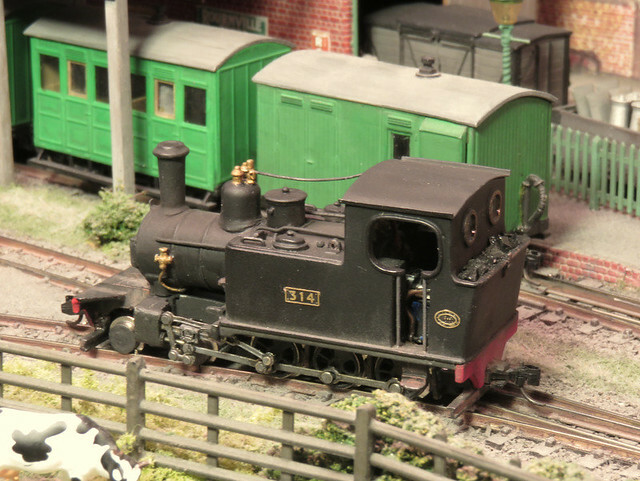 The collection of small i/c locos was fascinating, these are tiny in 009. 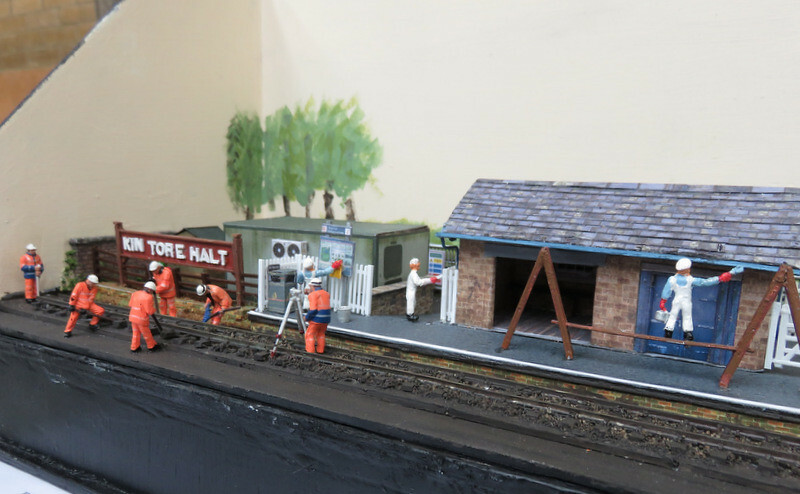 Now on to the Dave Brewer Challenge, which this year was for a diorama featuring a halt. 5 entries made it, and all were well modelled, so the judging must have been tricky. Promontorio (006.5) - Danny Figg. Feel the heat! L'Arret - Coleville-sur-Orme, 1944 (1:35, 17mm gauge) - David Hughes. 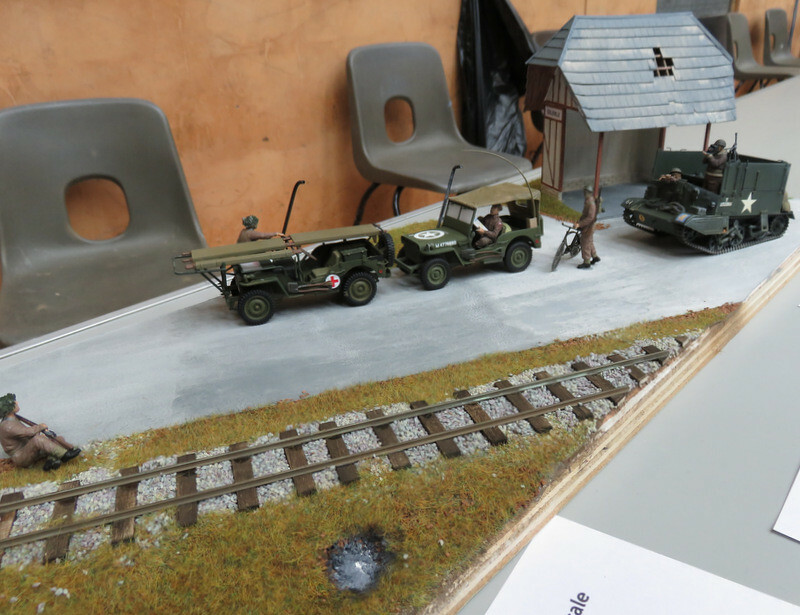 Very fine modelling, though arguably more military than railway. 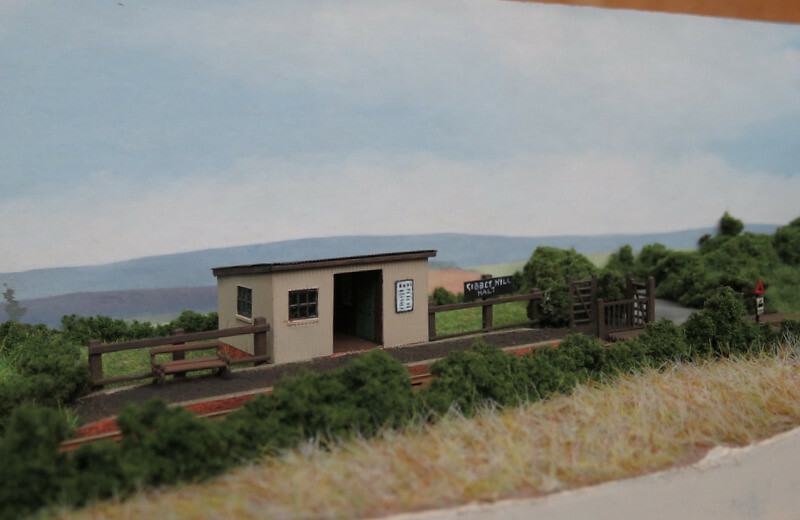 Gibbet Hill Halt (Nn3) - Simon Hargraves. A rural idyll. 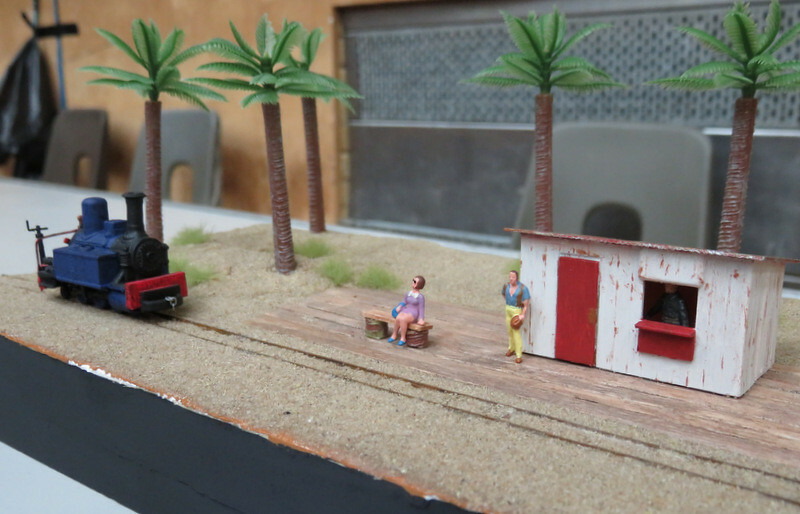 The realism in this scene is amazing considering how tiny this model is! Halt at major road ahead (006.5) - Steve Pearce. This was the winning entry. I wonder if it is because it was the only one to feature a complete train, or because of the humour? The scene is just after a farmer's truck collided with the brickworks train, and while the drivers argue, others are trying to catch the geese that have escaped from their broken crates. So another cracking show, and I could go on with more photos, but this post is big enough as it is. If you've time to browse some more I've posted an extensive collection of pictures to Flikr.